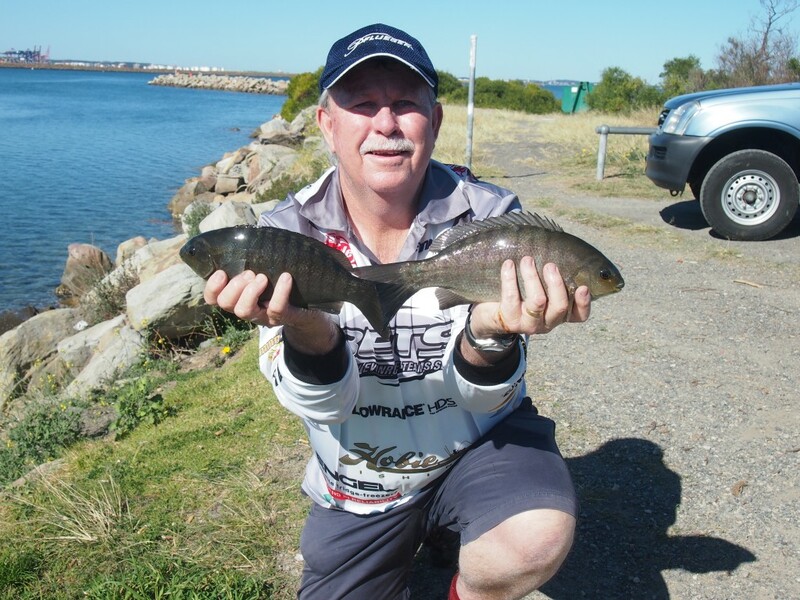 Gary with a couple of nice luderick caught while fishing off the breakwall in the background. 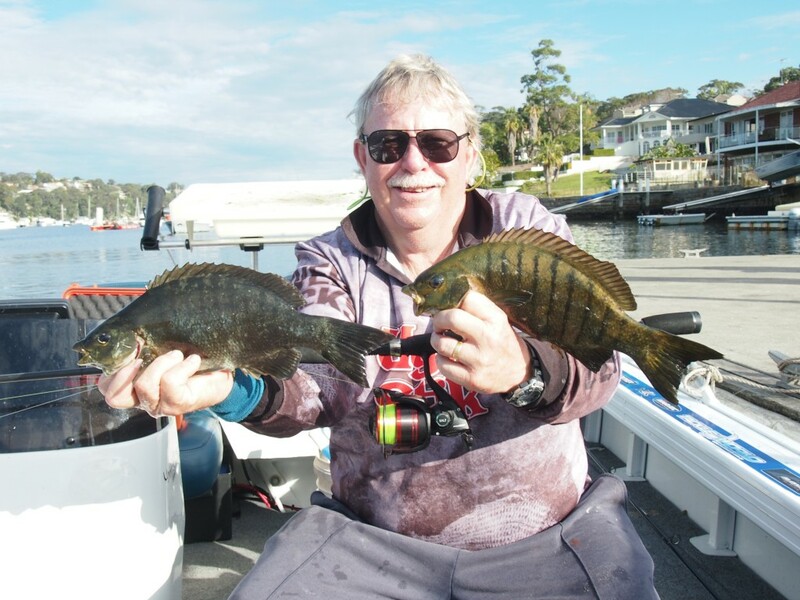 Luderick have a small mouth that is mainly used to graze on weed and cabbage, and even though I have caught luderick on nippers, worms and even lures I will target them in the estuaries using a small stemmed float. At times they can seem to be extremely hard to catch. Fishing with a small stemmed float is the main technique used, but I have caught them using the paternoster rig. My current outfits for fishing both land-based and out of a boat in the estuary is the Shakespeare Slingshot SP1062L, 3.2m, 2-5kg rod mounted with a Pflueger Salt 040SW reel spooled with 5 kilo mainline. Gary’s preferred out is the Shakespeare Slingshot SP1062L, 3.2m, 2-5kg rod mounted with a Pflueger Salt 040SW reel spooled with 5 kilo mainline. When it comes to the type of rig I prefer to have my float is left running on the line as this allows you to quickly adjust your depth when trying to work out at what depth the fish are feeding at. The running float also allows you change the deep as the tide changes. 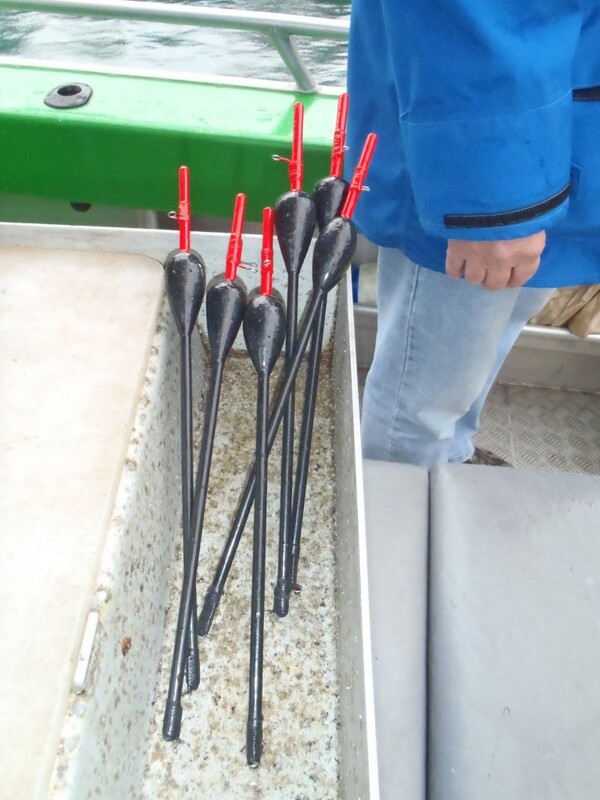 A float stop is used above the float to set the depth you’re fishing at. This free running float rig is compact and can be cast easily. When the rig hits the water, the weight of the sinker and bait will pull the line through the float until the stop is reached, then the weight of the sinker stands the float upright. The size of the float depends on the turbulence of water, but in calm conditions a fine pencil type float is best. Use a small No. 10 swivel below the float to eliminate line twist. Then a leader of 3 kilo fluorocarbon attached to a small No. 8 to No. 10 hook. Use just enough lead to make the leader hang straight down, and the float needs to have approximately 25mm of its tip above the water. Clamp size 00 split shot leads to the leader until the float rests at the desired depth. The float must be finely balanced so it goes down with the slightest bite, not have to be pulled down by the fish. The bottom split shot is usually kept at least 20cm above the hook. The techniques used for luderick are determined by the depth of water you’re fishing. Initially start by trying just above the bottom. You will know when your bait touches bottom because the float will lie sideways. If you get no result, alter your float stop and start trying with bait just clearing the bottom. Continue trying different depths raising your bait up a foot and so each time. The best bait for the estuary is green weed, which is plaited a few times around the hook shank leaving a trail of 15mm below the hook. As this weed swells in water it pays not to use too much. 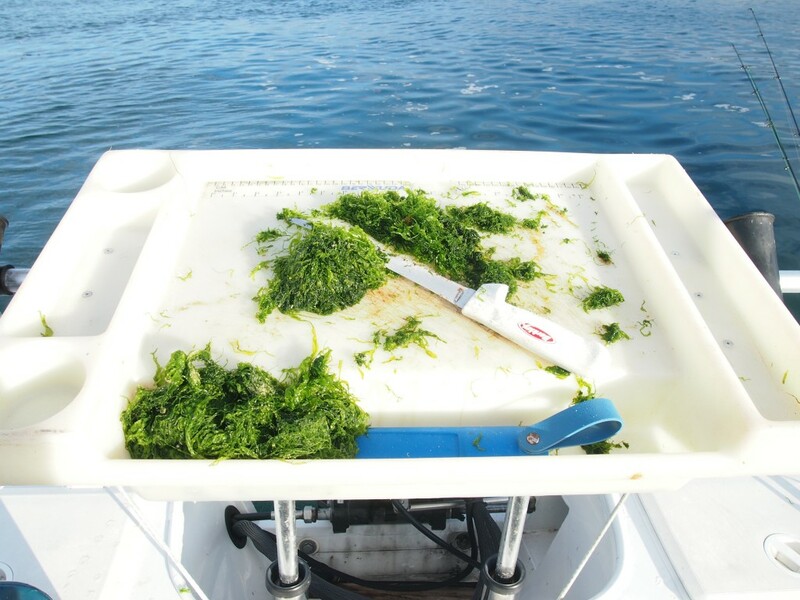 Sea cabbage is also great bait in the estuary, particularly if the smaller new growth leaves are used. To keep fish on the bite where you’re fishing you will need to berley. This berley is a combination of white bread, chopped up weed and or cabbage plus sand. The sand has to be moist enough so that you can make it into the size of a tennis ball and it doesn’t break up as you throw it. The timing of the berley is usually when you re-start your drift and is concentrated in the area you’re fishing. The floats for the estuary don’t have to be too big. These will do nicely. The ‘strike’, if it could be called that, is made with the rod laid slightly sideways against the way the float and fish are travelling. Always allow your float to go well down (about three seconds) before attempting to hook the fish. Take your time and let the fish bounce around for while, keeping the fish’s weight on your rod tip. It will eventually tire out so that you can lead it to the net. Make sure that you chopped up your weed finely for the berley. Luderick spots in estuaries are fairly constant and can often be learnt, just by asking. The areas to explore include deep water banks around sunken timber, rocky reefs, bridge and jetty pylons, or similar obstructions underwater. 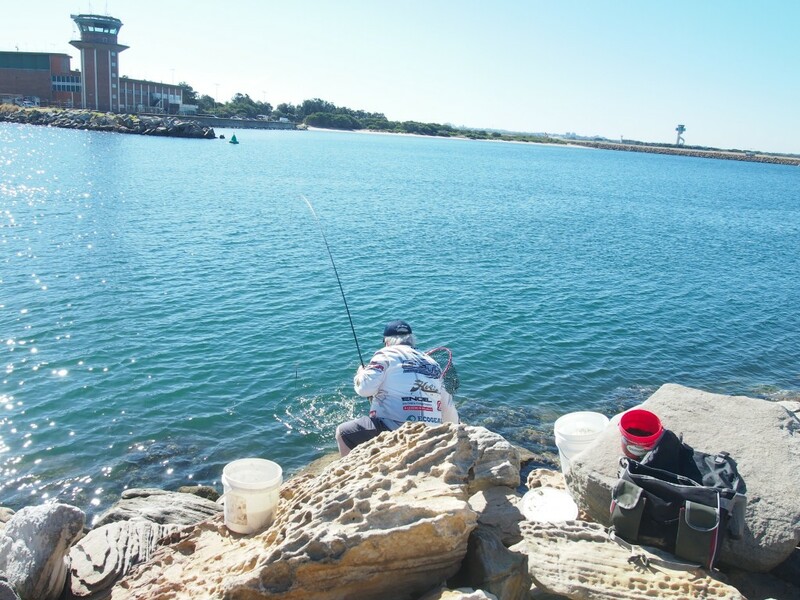 Along rock walls, particularly where deep water holes or changing wall formation have caused the tide to eddy or swirl can be productive at all stages of a tide. Notice how Gary has set up his position on the breakwall with his gear nearby.